Roads, sidewalks, and parking lots constitute a high percentage of impervious cover in high density areas and are a significant source of runoff. For this reason, effective drainage is a design priority in new development. Road construction or re-development presents opportunities to reduce runoff, conserve water, and incorporate low impact development (LID) or green infrastructure. “Green Street” design reduces erosion and pollutant loads to streams, improves street aesthetics by calming traffic, increases tree canopy, and makes streets more walkable and bikeable by incorporating LID principles. Green streets policies support attractive design for walkways and neighborhoods, such as this walkway along Scott Avenue in Tucson. Photo credit: Wheat Design Group. LID street features include curb cuts and vegetated curb extensions, or “bump-outs,” to capture and direct water to planted areas. Curb extensions have been used for many years to enhance pedestrian safety and calm traffic. Other Green Street features include permeable paving to allow stormwater to absorb into the ground, vegetated swales that slow water flow and remove sediment and pollutants, and reduction in street widths to minimize the amount of impervious area and help maintain existing hydrologic function. Green Streets can be applied to different types of streets in many settings, including residential, commercial, and arterial streets and alleys, using applicable LID features and designs. Green Streets policies have been adopted in a number of communities, including Washington DC, Portland, Oregon, and Tucson, Arizona. Integrating LID design into transportation planning requires code and policy change, technical guidelines, and an institutional re-evaluation of how rights-of-way are managed. As an example, to allow communities to reduce street widths to decrease impervious surfaces, the Oregon State Code allows local governments to adopt street design standards that supersede the Uniform Fire Code (UFC), which results in oversized street design to accommodate emergency service vehicles. A stakeholder team developed “Neighborhood Street Design Guidelines – an Oregon Guide to Reduce Street Widths” to provide guidance on how emergency vehicles can be accommodated while minimizing the width of streets. 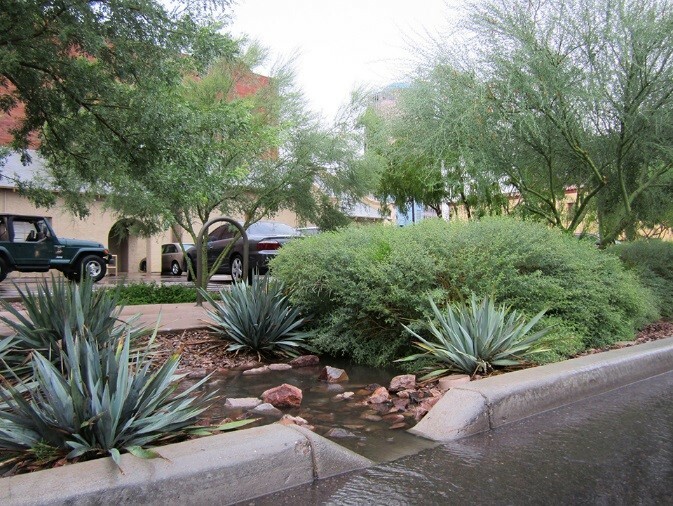 The City of Tucson Department of Transportation (TDOT) Engineering Division Active Practices Guidelines (APG), adopted in 2013, require incorporation of green infrastructure features into Tucson roadways wherever possible. The guidelines apply to both new construction and reconstruction, including widening and realignment, of publicly funded roadways or drainage projects that include a landscaping element. New street construction project budgets are required to evaluate the costs and benefits of green infrastructure. Vegetation must be able to survive on harvested rainwater within 5 years. A TDOT team reviews projects at each project stage, including early planning, the design concept report, design consultant scope of work, and construction, to determine if the intent of the guidelines is being met. Performance goals are established by TDOT and project consultants during the design phase. If the design needs to be modified during construction, the review team is notified and offers input on alternatives to meet the original standard. The guidelines clearly lay out the procedure of the Green Streets planning process from pre to post construction to ensure project success. The scope of work must integrate and maximize green infrastructure opportunities, and the specific roles and responsibilities of the City of Tucson Project Manager and the design consultant are identified to ensure that drainage planning, grading, and landscaping are planned in an integrated manner. Specific planning requirements are identified at several points of the plan submittal process. In addition, the ADOT project team is required to meet with the project’s general contractor at multiple stages both before and during construction. During a two-year landscape establishment period, a landscape architect must monitor the maintenance of the green infrastructure elements to ensure the system is properly functioning. These guidelines identify standards that make it relatively straight-forward to integrate green infrastructure features into street construction. The result of Green Streets policies and thoughtfully designed guidelines are attractive streets and walkways that reduce stormflow, filter runoff, and support sustainable, walkable landscapes.